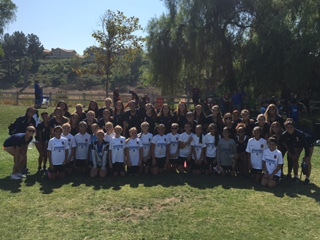 The G05 White wants to send a HUGE thank you to the Cal State Fullerton Women's Soccer team for coming out to support them at their game this past weekend. The G05 White has had the honor & privilege of being ball girls for the Lady Titans this season and has enjoyed watching and learning about "Big-Girl Soccer" from this wonderful group of mentors. Thank you to Head Coach Demian Brown, Associate Head Coach Michael Thomas, and Assistant Coaches Stacey Webster and Bryan Escalante for giving the G05 a front row seat to watch and learn from a winning women's college soccer program! Go Rangers! Go Titans!